North Korean media is actively promoting the superiority of its light industry products, likening Pyongyang’s department stores to product exhibition halls. Opened in 1982 after reconstructing Pyongyang’s former Hwashin Department Store, Pyongyang Department Store No. 1 is located in Pyongyang’s Jung-guyok and is North Korea’s largest department store. With nine floors above ground and one below, it sells numerous domestic goods as well as goods produced in China and other countries. Its most popular items are female beauty products. Between January and February 2015, North Korean leader Kim Jong Un visited Pyongyang’s cosmetics and shoes factories, where he directly mentioned famous overseas brands and repeatedly called for the production of world-class products. In early November 2015 North Korean media released a flurry of reports boasting about the improvement in the quality of its cosmetics. As reports in North Korea continue to pour out boasting about the improvement in the quality of its cosmetics, it appears that Kim Jong Un’s instructions to raise the quality of cosmetics suited to the tastes of consumers have achieved some results. ‘DPRK Today’ cited products on display such as soap, beauty cream, shampoo, and conditioner. “The brands were very distinctive, and the packaging has also changed. There were also many new eye-catching products,” the website reported. The article also referenced the cosmetic industry’s slogan, ‘World-Class Cosmetic Products—More, Better, Faster,’ and emphasized that the “goals and rate of progress of our cosmetics industry have changed. 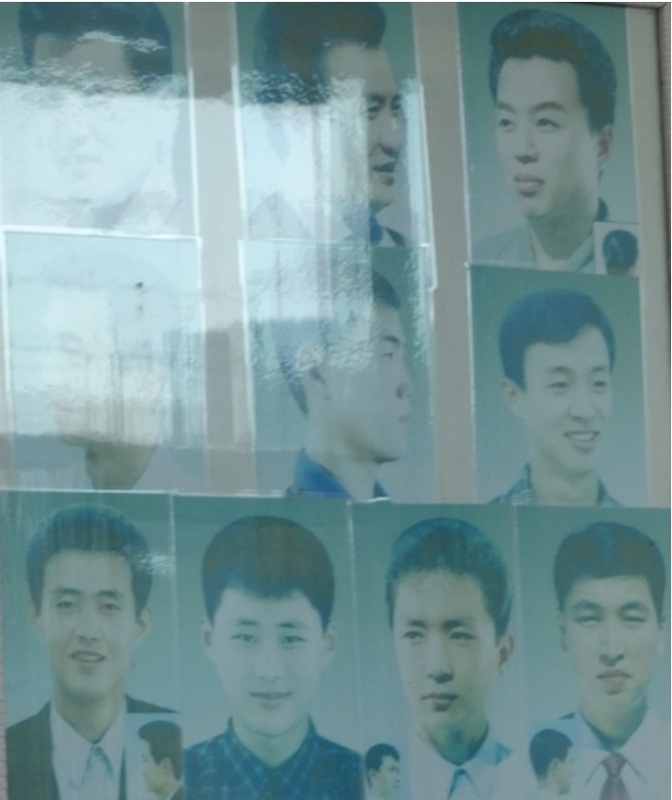 Those dreams were placed on many products displayed at the exhibit.” In order to achieve these goals, the Pyongyang Cosmetics Factory as well as the Sinuiju Cosmetics Factory are “constantly shortening the technology renewal cycle by modernizing the production process and better managing technological capabilities,” the website explained. Back in May 2015, the Choson Sinbo, a pro-North Korean newspaper in Japan, reported that the Pyongyang Cosmetics Factory was producing functional cosmetics with ‘natural’ and ‘hypoallergenic’ qualities. It mentioned the ‘Unhasu’ brand and stated that products such as beauty cream, lotion, and foundation had already been developed. The newspaper also claimed that the biotechnology division of the State Academy of Sciences had used stem cells to develop cosmetics with anti-aging, moisturizing, and whitening effects. Prior to this Kim Jong Un had visited the Pyongyang Cosmetics Factory in February 2015, where he issued instructions to raise the quality of cosmetics. “We need to make it so that our people prefer Unhasu products to foreign-made cosmetics, and further, so that Unhasu cosmetics become the talk of the global market,” he exhorted factory employees. The Chosun Sinbo, mouthpiece of the General Association of Korean Residents in Japan, reported that North Korea has developed and is now producing cosmetic products that utilize new natural materials and cutting-edge technology, including stem cell technology. “At the Pyongyang Cosmetic Factory, they are concentrating on developing functional cosmetic products that are natural and low stimulating,” the Chosun Sinbo revealed on April 28. The biotechnology and light industry divisions of the State Academy of Sciences, as well as scientists, teachers and researchers at the Han Duk Su Pyongyang Light Industry University, are assisting in this work. According to researchers within the biotechnology division, the product utilizes stem cell technology in regenerating skin, and it is effective in preventing aging, moisturizing skin, and lightening skin. 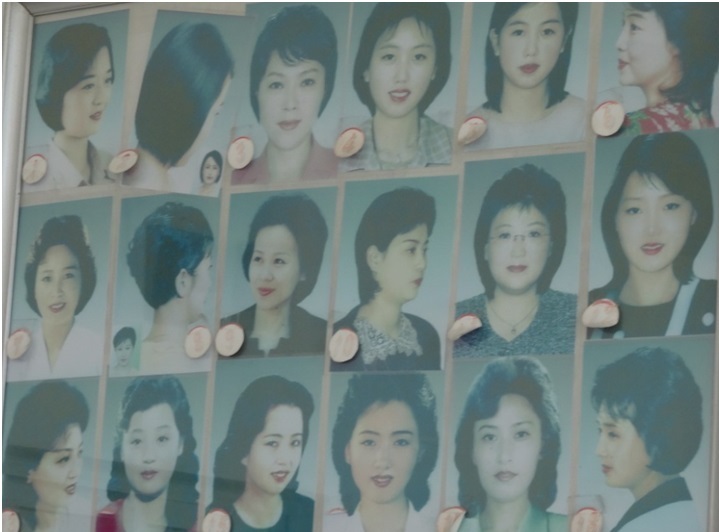 They said that they developed the cosmetic additive (which has a pine tree scent) at the Pyongyang Natural Perfume Research Center, and that this product matches the characteristics of one’s skin by age and is effective in things like skin lightening and removing wrinkles. They added that they have also developed a beauty cream that has a moisturizing and whitening effect due to its natural hydrating materials derived from kelp. The Pyongyang Cosmetics Factory was established in April 1962 and is North Korea’s representative cosmetics factory, producing all sorts of cosmetic goods such as the ‘Unhasu’ brand. It also produces over 60 types of functional cosmetics including soap, shampoo, beauty cream and skin lotion. 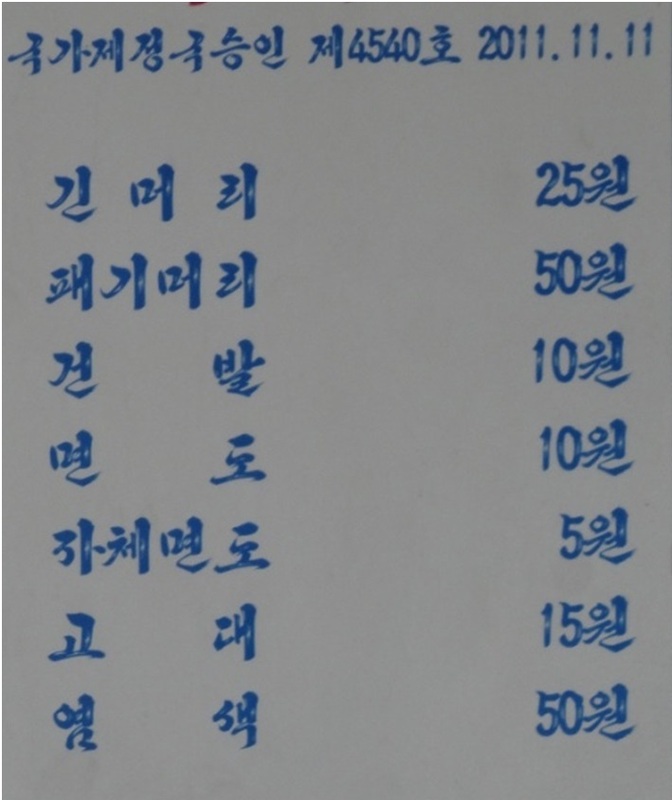 A friend passes along some pictures (taken in 2014) of Pyongyang haircuts and prices. 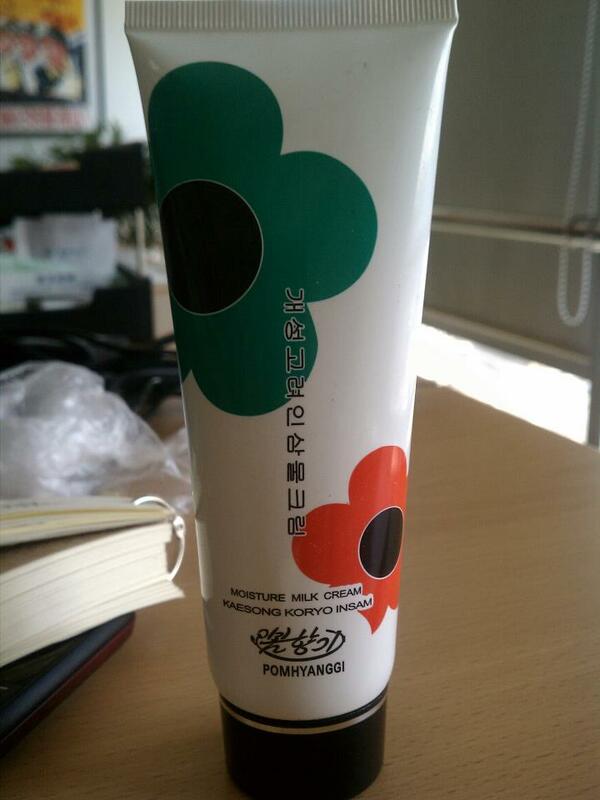 A friend of mine visited the DPRK and returned with a bottle of hand moisturizing lotion (pictured above). 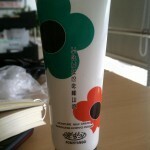 In English it is called “Kaesong Koryo Insam Moisture Milk Cream”. The Korean name is “개성고려인삼 물크림”, and it is manufactured by a company called Pomhyanggi (봄향기). According to Kwang On Yoo, the name translates to mean “Spring Fragrance”. Popmhyanggi is a product line of the Sinuiju Cosmetics Factory (satellite image here). Sales are promoted through a Joint Venture company–the partner(s) are unknown at this time–called the Korea Pomhyanggi Joint Venture Company. The JV apparently operates out of an exhibition hall in Moranbong-guyok, Pyongyang, which was opened in 2007. Here is a link to an additional KCNA story on the cosmetics line. The marketplace has become an extremely important ground in North Korean people’s lives. 70 percent of North Korean households in the city live off trade, handicrafts and transportation businesses related to trade. If the jangmadang works well, people’s living situation is good, otherwise it is not. In the situation where the food distribution system has broken down, the whole economic existence of the populace is bound up in jangmadang trade. Trade is bound to generate successful merchants but also failures, due to a lack of know-how or confiscation of products by the People’s Safety Agency (PSA), or simply because a competition system operates. These failures in the jangmadang do not have any second opportunity to rise again so they frequently choose extreme acts like defection, criminality or suicide. Failure is serious. However, the revitalization of markets has caused great changes in North Korean people’s values. The individual-centered mentality among the people is expanding and the belief that money is the best tool is also spreading. Due to such effects, the North Korean communist authorities in 2008 made the regulation to prohibit women younger than 40 years old from doing business, but of course the people use all necessary means to maintain their survival. 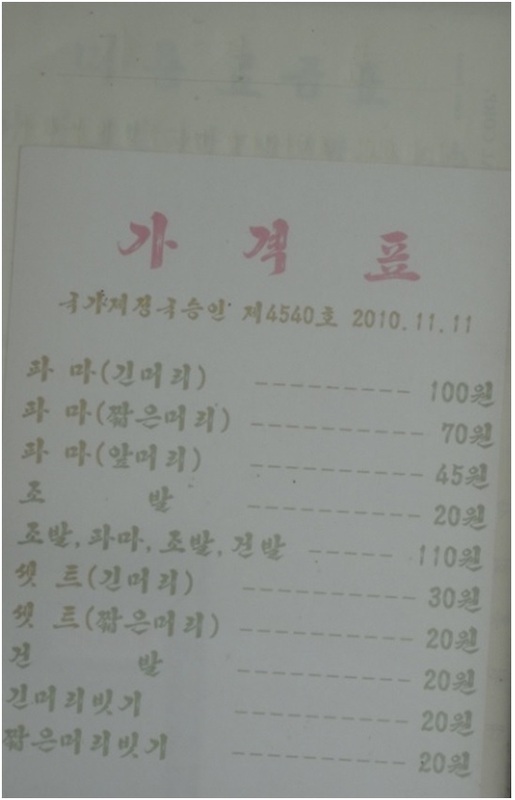 Daily NK investigated the 2008 top ten items in the jangmadang, so as to observe developments in North Korean society. Since 2000, the most ubiquitous street food has been “rice in artificial meat,” which is made from fried tofu with seasoned rice filling. This food is found everywhere on North Korean streets. One can find women who sell this snack in alleys, at bus stops and around stations. 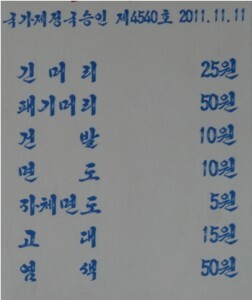 It costs 100 to 150 North Korean Won. Meanwhile, the most popular street food is fried long-twisted bread. Individuals make the fried bread at home and sell it on the street. 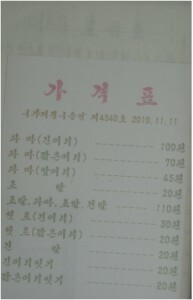 The length of the fried bread is around 20 centimeters and it sells for 100 won. In around 2005 corn noodles were popular on the streets, but now street-stands for noodles have largely disappeared due to the existence of a permanent store controlled by the state. These days, if one can afford to eat corn noodles, at approximately 1,000 won for a meal, one can safely say that one is living comfortably. The reason why North Korean people like car batteries is that the authorities provide a reliable electricity supply during the daytime, when consumption is less than at night, but at night they don not offer it. The authorities shut down the circuit from around 8 PM to 9PM, and from 12 AM to 2 AM: when the people watch television the most. As a result, the people charge their car batteries during daytime and use it at night. A 12V battery can run a television and 30-watt light bulb. If they utilize a converter, they can use a color television, which needs more electricity. Ownership of batteries is a standard of wealth. Officials use electricity from batteries in each room. They usually draw thick curtains in their rooms, to prevent light shining through that might draw attention to their status. A South Korean brand pressure rice-cooker called Cuckoo appeared as a new icon for evaluating financial power among North Korean elites. It has spread from the three Chinese northeast provinces into North Korea. In North Korea, Chinese rice and third country aid rice, dry compared to Korean sticky rice, generally circulates, but if the lucky few use this rice-cooker, they can taste sticky rice the way Korean people like it. There are Cuckoo rice-cookers from South Korean factories that arrive through Korean-Chinese merchants, and surely other Cuckoo products from Chinese factories. These two kinds of rice-cookers, despite having the same brand name, sell for different prices. The Chinese-made Cuckoo sells for 400,000-700,000 North Korean Won (approximately USD114-200), while the South Korean variety costs 800,000-1,200,000 (approximately USD229-343). A Cuckoo rice-cooker tallies with the price of a house in rural areas of North Korea. According to inside sources, they are selling like wildfire. The electric shaver is another symbol of wealth. It is not that they use electric shavers normally, because one cannot provide durability. At home, North Korean men generally use disposable shavers with two blades made in China or a conventional razor. However, when they take a business trip or have to take part in remote activities, they bring the electric shaver. There are North Korean-made shavers but most are imported from China. Among Chinese products, you can see “Motorola” products and fake-South Korean products with fake labels in Korean. A Chinese-made electric shaver is around 20,000-40,000 North Korean Won. Dress shoes are one of the most important items for Chosun men when they have to participate in diverse political events, loyalty vows or greeting events at Kim Il Sung statues on holidays. Right after the famine in the late 1990s, it was considered a symbol of the wealth, but now general workers, farmers and students are wearing dress shoes. The shiny enameled leather shoes with a hard heel cannot be produced in North Korea because of a lack of leather. The North Korean authorities provide the National Security Agency (NSA) and officers of the People’s Army with dress shoes, which are durable but too hard and uncomfortable. Shoes for general citizens and students are mostly made in China and some are produced in joint enterprises in Rajin-Sunbong. The price of shoes ranges from 30,000 to 100,000 Won depending upon the quality. Cosmetics and accessories for women are getting more varied. Lately, false eyelashes have appeared in the jangmadang in major cities. Chinese cosmetics are mainly sold, alongside fake South Korean brands. In Pyongyang, Nampo, Wonsan and Shinuiju Chinese and even European cosmetics are on sale. “Spring Fragrance,” a North Korean luxury cosmetics brand, is famous for being Kim Jong Il’s gift that he presents to women soldiers or artists when he visits military units or cultural performances. It costs more than 200,000 North Korean won. Lotions for women, made in China, are approximately 2,000-4,000 won, foundation cream is 3,000-5,000 won, and lipstick is from 500 won to 2,000 won. Hand cream is 3,000-5,000 won. “Hana Electronics” was originally set up to produce CDs and DVDs of North Korean gymnastic performances or other artistic performances, so as to export them foreign countries. The company has been producing DVD players since 2005. Due to the state monopoly, the DVD player of the Hana Electronics dominates the market. North Korean people call a VCR and a DVD player a “recorder.” Since around 2005, after the booming interest in South Korean movies and dramas, the players have been selling very well. At the beginning, North Korean visitors to China brought the DVD or CD players into North Korea, but as they got popular among the people, Chinese-made players were imported from China and since 2006 they have been really popular in every jangmadang. Accordingly, since 2006, the authorities have started blocking the importation of the Chinese player and are selling the Hana Electronics players, which sell for around a 20 or 30 percent higher price than Chinese players in state-run stores. Now, they can be sold in the jangmadang by private merchants and comparatively free from inspection by the PSA. The prices are 130,000-150,000 won. In major cities, numbers of motorcycles are increasing. Especially in border regions where smuggling with China is easier than in other cities, motorcycles are common. The motorcycles are ordinarily used for mid or long distance business. Most motorcycles are made in China and some are Japanese second-handed products, which sell for 1.5-2.5 million won. 125cc new products are over 5 million won. The cheapest second-handed motorcycle is 500,000 won. Demand for vinyl floor coverings and vinyl has been increasing since the late 1990s, when residential conditions improved. In the late-1990s people had to use sacks of cement or Rodong Shinmun (newspaper) as a floor covering, but now they are using vinyl floor coverings. Uses for vinyl are unimaginably diverse: from a basic protection against wind and cold to when people take a shower at home in the vinyl tunnel hung on the ceiling of the bathroom. Depending on the thickness and width, there are four or five kinds of vinyl in the jangmadang for from 150 to 500 won. Vinyl floor covering is a Chinese product selling for from 3,000 to 10,000 won. The North Korean authorities have toughened their regulation of the market. The North Korean authorities have strengthened market regulations, such as prohibiting goods that can be sold in the market or fixing prices. Also, they have adjusted the minimum age of women who can sell in the jangmadang (markets) to 45 from 35 years. If women who are under 45 sell in the market or sell prohibited goods, the safety agents in charge or the managers of the jangmadang confiscate the products by force or charge fines. The regulation of the market has spread to long-distance merchants who use rails. If young women are carrying a lot of possessions in trains, the safety agents steal the goods by force and search their bags without discretion. Pyongyang has also made public announcements to prohibit women under 49 from trading at the market starting December 1st. Currently, women under 39 are prohibited. Further, they are only allowed to sell at permitted locations in the market. North Korean rail safety agents ride in every car of North Korea’s rails. The basic duties of rail safety agents consist of checking travel certificate and citizen cards and regulating suspicious passengers, including crimes of theft. On top of this, their authority to inspect women who are engaging in long-distance trade has increased. The rail safety agents force passengers who carry large loads suspected of being goods for sale to come to the inspection car. The safety agents search the luggage and make threats, such as reporting them. Recently, after the prohibition of sales by women under 45, if the owner of the luggage is a woman under 45, she been threatened to be reported. Long-distance merchants can only claim their goods if they give bribes such as cigarettes or cash to the rail security officer. Also, with the increase in new regulation authority by the rail safety agents, the phenomenon of sexually harassing young women who engage in long-distance trade or requesting wrongful sexual relations has been taking place.